Gain insight into finding your unique voice as a jewelry artist by listening to Jennifer’s professional journey. 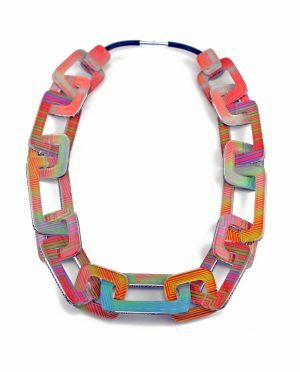 Jennifer will talk about how she developed her signature layered acrylic technique and what it takes to build a business and a career as a studio jeweler. She will also touch on working with galleries, exhibiting work, promotion, and creating a niche to build a client base within a specific market. Explore the gallery with an original soundscape performed live by special guest Ian Lehman. In addition to the show on view, Jennifer will be bringing an extra selection of jewels to the gallery for one day only. The artist will give a brief talk about the work in the exhibition and answer any questions. Jennifer will share about her process and inspirations behind Night/Dazed.